The next big things in H2020: Big data and the exposome. Are you ready? Despite that you are probably still writing proposals for the 2016-2017 Horizon 2020 work programme, we are already looking forward to the next and final phase: 2018-2020. Towards the end of 2017 scientists and R&D professionals are anticipating the publication of the new work programme. What does it hold for you, and are you ready to capture your share? Although the new work programme is expected to be officially published in October 2017, several draft documents have already been circulating. Where we have previously observed a shift from more preclinical and fundamental research to more translational and clinical research, this shift is now expanded towards 4 Health topics with a high societal value and integration of multiple existing components to leverage past investments and efforts. Two topics we would like to highlight are Big Data and the exposome. Big Data collection, storage and analytics is a continuously evolving concept which has still not been consolidated in day-to-day healthcare, biomedical sciences and the biotech industry. We are well capable of gathering enormous amounts of data in very intricate ways, however, it is not the challenge to gather new data, but conversely using those amounts of data for real and efficient impact. It has indeed been a major technical barrier to efficiently use data from different information sources representing the overall picture of patient experiences. This requires a.o. smart data systems and analyses that ‘use the same language’ to subsequently translate this to real applications. To subtract intelligent knowledge from raw patient datasets a change is needed in the telemetry and high-frequency data by completing the patient-image with low and high-frequency observations of e.g. therapy and imagery. For example, with imaging diagnostics, where the interpretation of x-ray images, CT and MRI scans is moving from hands-on clinician-based judgement to analytical intelligent algorithms and pattern analysis for risk or patient stratification and diagnostics. Once data standardisation is in place, the next step in the pipeline is to integrate all different data sources. In the near future, these data sources will increasingly be derived from direct, on-line monitoring of the individual patient, e.g. with wearables and the internet of things (IoT) in healthcare settings such as the hospital. Focussing on patient-centred care, wearable devices, home monitoring tools and mHealth apps have the potential to significantly change the healthcare industry. In addition to convincing providers and patients alike, integration of patient-generated data into products, and how to fit this to the clinical workflow, will be an important focus of future projects. Integrating information from imaging, wearables or IoT devices is not only essential for analysis but also for (adaptive) interpretation of data and representation. Cognitive computing and machine learning have the potential to change clinical decision making. Semantic computing allows the training of algorithms and enables the formation of connections and conclusions about integrated datasets. Personalised healthcare requires the combination of all data pipeline steps mentioned above with genomic sequencing and drug and therapy development pipelines. This will prompt a change in multiple precision medicine tools such as decision support systems (DSS), identification of novel (drug) targets and subsequent lead generation, health technology assessment (HTA) methods and smarter clinical trials. Combining smarter devices and fluid data exchange will allow optimised clinical-trial design and outcomes and greater efficiency. In addition, trials can increasingly adapt to safety, efficacy and effect signals seen only in small but identifiable subpopulations of patients, improving the personalised aspect of clinical trials. Personalising therapies based on individual unique circumstances is a major trend and focus of the upcoming work programme. In relation to the patient’s individual circumstances there has been a lot of focus on the internal health mechanisms and the monitoring thereof. The exposome, the totality of human environmental exposures complementing the genome, is increasingly regarded as an essential component in interpreting patient behaviour and prognosis treatment response. Following the 2012 granted HELIX and Exposomics projects the EC has now put the Exposome high on the agenda. We can expect projects integrating environmental health research with genomics and physiology. The greatest challenge here is to combine various time-varying exposures with different technologies that result in different dataset types. There will be a strong interaction between Big Data solutions and the measurements, analyses, interpretations and tools involving the exposome (Fig 2). How to prepare for the new Horizon 2020 work programme? To prepare for these topics, 2017 should be focussed on getting your data pipeline ready: (1) identify your key assets (data, analysis tools, acquisition instruments, protocols and more), (2) identify gaps up and down the data pipeline (3) organise/expand your network to accommodate for those gaps and (4) make sure relevant people understand the value of your assets. ttopstart can help you to set up such a multi-year (funding) strategy. Personalised Medicine – A familiar topic and returning in this program. It includes chronic, rare and communicable diseases, targeting children and ageing population, as well as adolescents, adults, minorities, high-risk groups, gender-oriented groups, all encountering a threshold to adequately and timely access healthcare. Projects should include an understanding how personalised medicine can impact economy and healthcare system transformation. Innovative healthcare industry – In the 2018-2020 programme we will see again the return of SME-dedicated grants (SME Instruments) and the implementation of loans with the upscaling of the InnovFin Infectious Diseases Pilot. Sustainable and evidence-based healthcare systems – In the context of personalised medicine, management of chronic diseases and the promotion of health it is essential to develop new models for effective, accessible and sustainable health interventions and care systems; e.g. developments in HTA methods, population-based intervention strategies and the inclusion of societal factors suggesting contributions from Social Sciences and Humanities. Innovative health and care delivery services – Integration of care – Realisation, assessment and upscaling of demand-driven innovation is approached with healthcare eco-systems which approach key challenges such as cancer, cardiovascular diseases, dementia, mental health and morbidities. This includes structural aspects such as organisation, financing, business models, training, hospital and telemedicine, home and self-care and patient empowerment. A special focus goes out to those needing improvements in health literacy. The human exposome – This is a new topic in Horizon2020 which aims to assess the total impact of life-long exposure to environmental influences, and how it impacts their health. 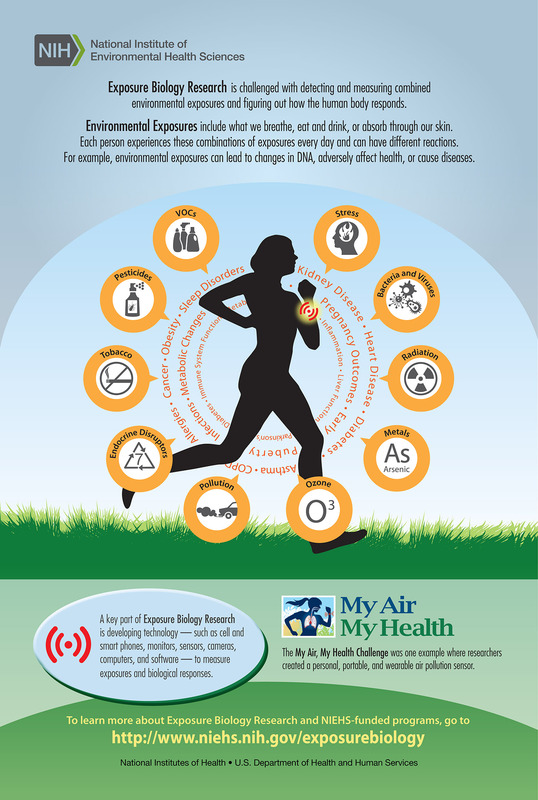 This involves deciphering biological pathways at the intersection of lifestyle, physical environment and genetics, using existing data and new data and the development of cost-efficient sensors to monitor the exposome. In addition, the impact on healthcare and policymaking will be taken into account. Special attention will be given to the causal relationship between external exposure and health impact. Global changes and health – In relation to the aforementioned Exposome, it is another challenge to assess how global changes in e.g. climate and migration may affect healthcare and economy, with a specific aim on the former. eHealth and mHealth – Also a returning topic is eHealth, now complemented with the newer mHealth. The current aim is support research and innovation in eHealth and mHealth to accelerate the computerisation of medicine to meet the public need of better health, prevention and well-being and of the service providers to digitise diagnostics, treatments and management. Disruptive IT methods and in silico medicine will be key topics in order to ensure interoperability, standardisation and health innovation upscaling at a European level. ICT for Active and Healthy Ageing – Personalised solutions developed from ICT progression such as AI and the Internet of Things to support the prevention and engagement in active and healthy ageing to support the Silver Economy (the market of major opportunities for new jobs and growth related to the ageing population). Trusted Big Data solutions for healthcare – Big Data, also a returning topic, but now with special focus on security of ICT based innovation for early risk detection and interventions of key disease areas and to use adaptive aggregation and use of a variety of existing data sources. Cybersecurity for healthcare - To address issues related to cybersecurity in data privacy, protection of healthcare data. We will publish more on the 2018-2020 work programme. Are you interested in discussing future opportunities with us? Perhaps you'd like help with preparing for the new Horizon 2020 work programme? Contact us today and find out the possibilities.